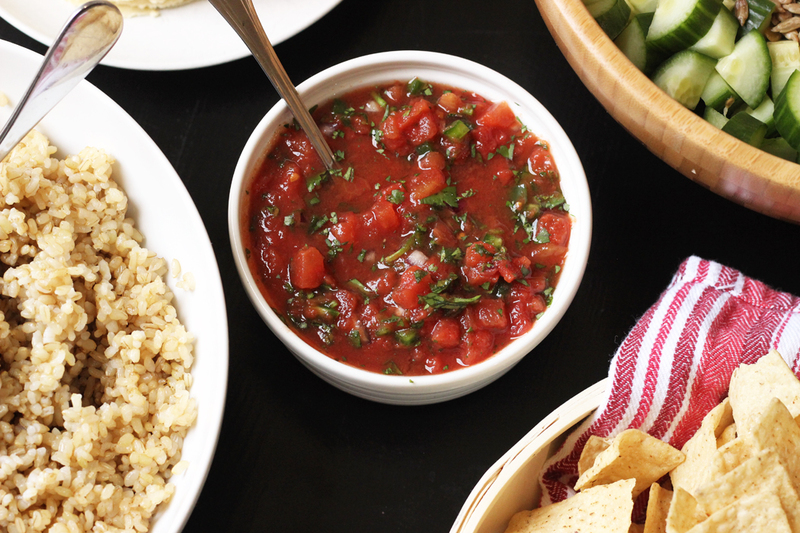 If you’ve been buying salsa in a jar, it may be time to think about making Homemade Salsa. It’s cheaper and tastier than the commercial varieties. And so easy! Since we eat so much Mexican food at our house, we eat a lot of salsa. When we first married, I paid $4 for a 16-ounce container of salsa fresca every week. It was refrigerated and I thought it was. the. best. Ha! Once I realized that I could make twice as much for half the price, I quit buying it. On the occasions where I’m lazy or in a hurry and I’ve bought the old varieties, we’ve been sorely disappointed. Why buy it when you can make it better and cheaper? 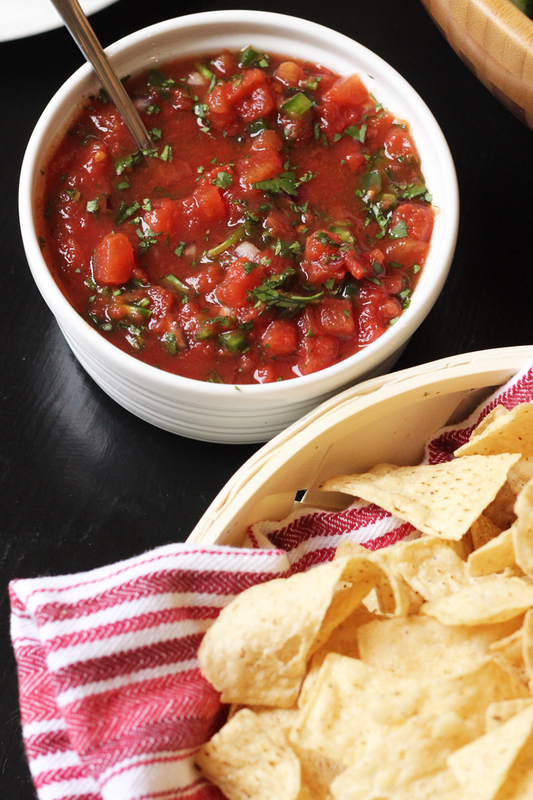 Homemade salsa is the only way to go. This is the homemade salsa recipe I prepare weekly, using canned tomatoes. 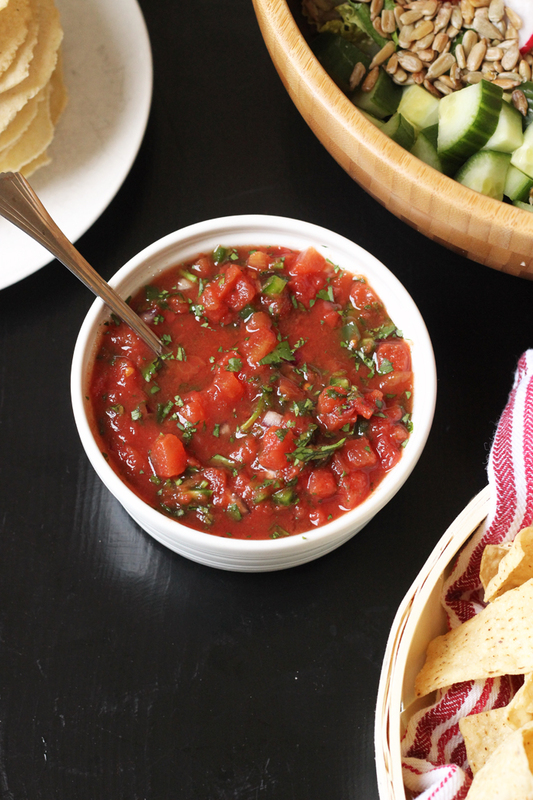 Later in the summer when fresh garden tomatoes are in abundance, I make this salsa. But don’t thumb your nose at salsa made from canned tomatoes. 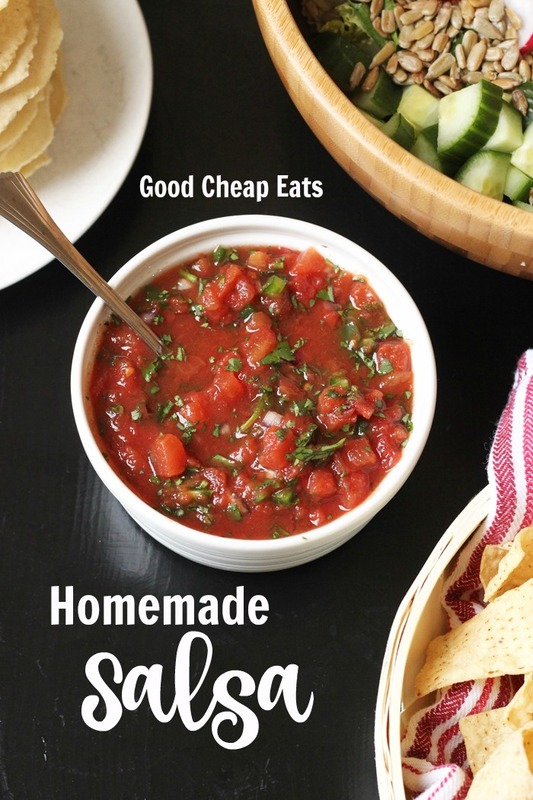 This homemade salsa recipe is quick and easy to make, and canned tomatoes are more readily available than really good fresh tomatoes. The amount of heat will depend on which chile you use. Serrano will be hottest; crushed red pepper will be mild; jalapeno will be somewhere in between. Homemade salsa rarely lasts more than a few days at our house, but know that this will be good, up to a week in the fridge. Do a price comparison. I know that Costco is the best place to buy ingredients in bulk, like canned tomatoes, when there isn’t a great sale elsewhere. I keep track of prices so that I know who has the best deal where. Recently I bought twelve 15-ounce cans for $6.49, making them 54 cents each. Stock up on ingredients when they are on sale. For instance, when I see a great price on onions, I buy a lot. Store your cilantro so that it lasts! Most recipes only call for a handful of the fragrant herb, so stretch that purchase as far as you can. Better yet, grow your own in a pot in the kitchen or in the back yard, weather permitting. In the past, I’ve computed my costs for making this recipe, based on the above tomato prices to work out to be $1.51 for a quart of salsa! That’s a much better price than buying it in a jar! 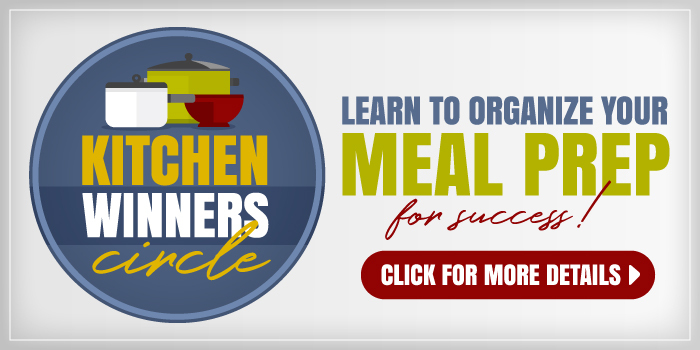 Making your own is a great way to save money on a good eat. citrus reamer – This is super handy for juicing lemons and limes quickly. In a large mixing bowl, combine the tomatoes with their juices, the cilantro, chile pepper, and lemon juice, stirring gently. Season to taste with salt and pepper. Chill until ready to serve. Serve with tortilla chips or other Mexican dishes. We always make homemade salsa also! My FIL is from Chile and his is amazing, Super similar to yours, but he also adds a clove or two of garlic, and uses green onions instead of sweet. We also add fresh tomatoes (seeded) when in season. Delicious! @Anna, I have never frozen salsa, but I should! I’ve been making almost this same recipe for years! I use a 14 oz can of diced tomatoes and a small can of store brand rotel ( both drained) instead! Then I put it all in the blender and pulse a few times. I stumbled across it looking for a copy cat recipe of our favorite “Chili’s” salsa. No one ever believes that it has no fresh tomatoes, and it is soooooooo good! I also LOVE mexican food. And tortilla chips add up & are never as good as in the restraunts. I make my own. Heat up some grease (or use a fryer) cut corn tortillas into trianges ( i use a pizza cutter) & fry them on both sides until golden brown & crispy. 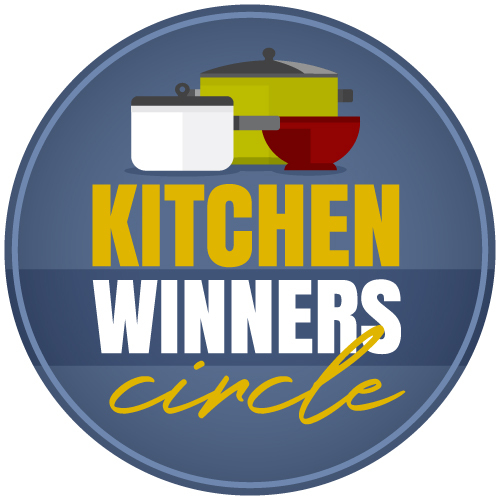 Remove & cool on a paper plate w/ paper towels(to absorb the grease) Sprinkle w/ salt. I have tried cutting back on salt, but these just aren’t as good without the salt. They are a hit anywhere I go. I always fry up a whole package of corn tortillas & store them in a zip baggy to keep fresh. @beth @ fabulouswon, Iodine is a necessary mineral in the diet. Effects hormones (thyroid), ones growth and brain function, so it would be good to get it elsewhere if not in salt. @Ellen, that’s a great point. My target prices do effect it if you are looking at it from an econ standpoint. My husband doesn’t care for jarred salsa, so I’d make it anyway. But, I generally buy the tomatoes for $1 or less and cilantro regularly goes on sale here for $0.25 to $0.50, so it is more economical for us in the market we live in. (Southern California) If you have a source of free homegrown tomatoes, that makes it even moreso. 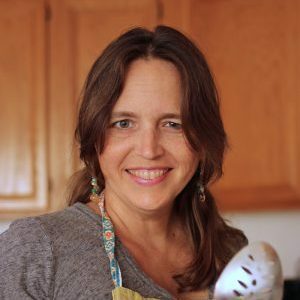 i can’t wait to try this recipe and take to our 4th of July party…I’m nervous though since my cousin makes his pretty good and it all comes from his garden, not sure how mine will rank. If it freezes well, I can see it being cheaper using a #10 can of diced tomatoes from Costco. Thank you, I’m excited to try this!